Europe’s Philae lander found a surface as hard as ice and organic molecules after it bounced to a stop on a comet last week. Scientists looking over the spoils from the plucky little Philae probe released some of the first results from the mission Monday after a hectic week of descent preparations, a dramatic landing that included three touchdowns, and more than 60 hours of data gathering. After coming to rest on its side, Philae continued transmitting data intermittently when in range of Rosetta, the European-built orbiter that deployed the refrigerator-sized lander for its descent Wednesday. Rosetta continues flying around comet 67P/Churyumov-Gerasimenko, with at least another year of observations planned as the icy world moves toward the sun. It will heat up and give off more gas and dust through perihelion — its closest approach to the sun — in August 2015. Before its battery died, Philae unfurled an instrument boom to study the comet’s surface properties. The MUPUS instrument was designed to hammer into the nucleus about 1.5 meters (about 5 feet) from the lander, and data show the system worked as planned despite Philae’s precarious position lodged against a rocky face at an angle with one leg pointing into space. 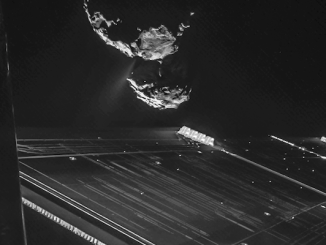 According to a DLR press release, the MUPUS team estimates the outer skin of the comet’s nucleus — at least where Philae settled after its bouncy landing — is as hard as ice. “With MUPUS it has been possible to directly study the strength of a comet’s surface for the first time — and 67P/Churyumov-Gerasimenko proved to be a ‘tough nut to crack,'” DLR said in a statement Monday. The MUPUS sensors were supposed to measure the comet’s temperature, the mechanical properties of its surface, and its thermal conductivity. Only thermal and acceleration sensors in Philae’s two harpoons were not used, DLR said, because the anchoring system was not deployed during landing. On Friday — the lander’s last day of operations — ground controllers sent commands to activate Philae’s drill. 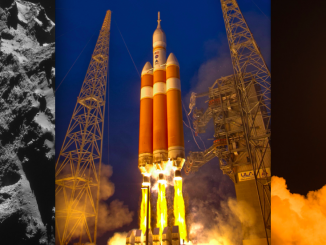 The system was designed to collect core samples a few inches deep and deliver the material into two of the lander’s instruments — ovens that would have heated up the bits of rock or ice to measure their make-up. Philae’s descent imaging camera was also switched back on and took up-close images of the comet’s nucleus at the lander’s final resting site. 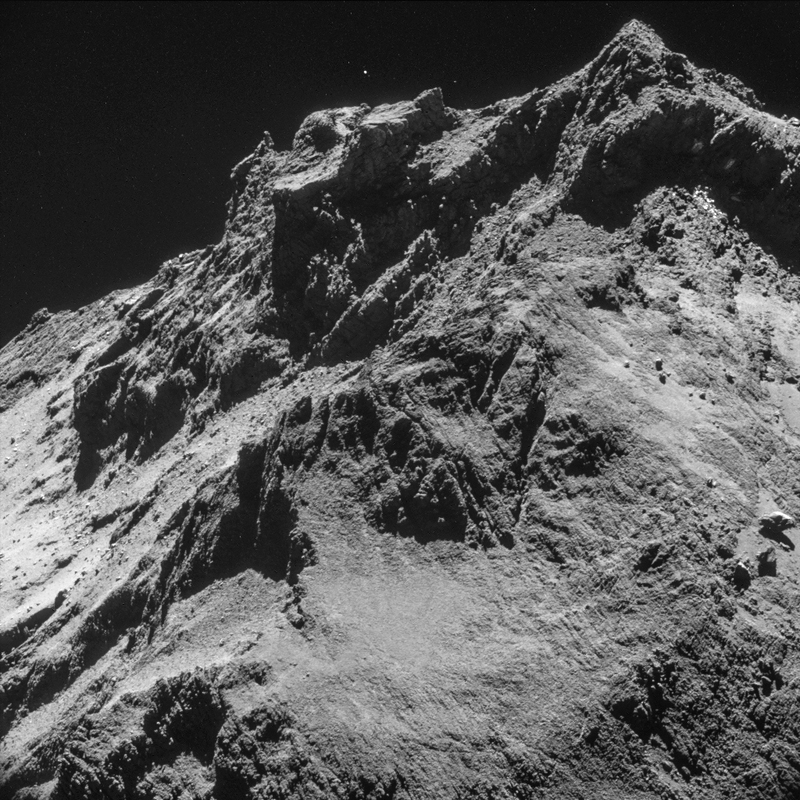 The down-facing camera also recorded imagery of Philae’s descent to the craft’s initial landing site before it rebounded to two more touchdowns. 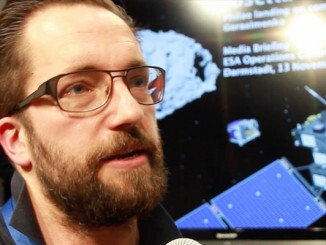 Scientists were also able to use Philae in conjunction with Rosetta to study the comet’s internal structure, DLR said. “To achieve this, the lander and orbiter were on different sides of the comet and worked together to analyse the comet nucleus by passing radio signals through it and creating a three-dimensional profile of the core,” the DLR statement said. Scientists are hopeful Philae will recharge its batteries in the coming weeks and months, allowing for the mission to resume as the comet nears the sun.